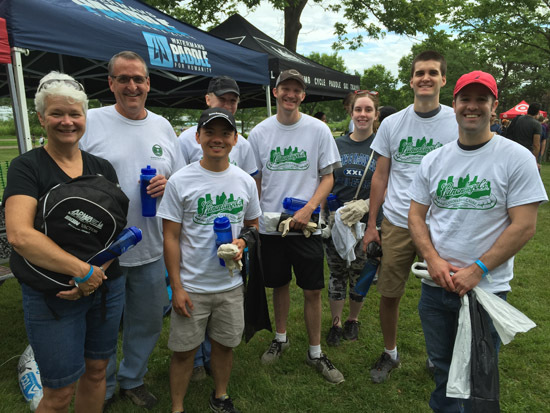 APWA-MN Chapter volunteers gave back to the community on July 26, 2015, picking up 25 pounds of trash around Lake Hiawatha and Lake Nokomis in partnership with the Minnehaha Creek Watershed District. A total of about 1,600 people participated in this annual event, leading to the removal of four tons of trash! Learn more in this recent StarTribune article. APWA Contingent (L to R): Sue Mason, Steve Schmidt, Nelson Vang, Kari Jensen, Andy Loftus, Kirsten Kelly, Adam Roberts, and Michael Thompson. Not pictured: Mark Mason and Jeannine Clancy.